Not to be confused with Herefordshire. Motto: "Trust and fear not"
Hertfordshire ( i/ˈhɑːrtfərdʃɪər/ ; often abbreviated Herts) is a county in southern England, bordered by Bedfordshire to the north, Cambridgeshire to the north-east, Essex to the east, Buckinghamshire to the west and Greater London to the south. For government statistical purposes, it is placed in the East of England region. In 2013, the county had a population of 1,140,700 living in an area of 634 square miles (1,640 km2). Four towns have between 50,000 and 100,000 residents: Hemel Hempstead, Stevenage, Watford and St Albans. The county town, Hertford, once the main market town for the medieval agricultural county ranks 13th in population today deriving its name from a hart (stag) and a ford used as the components of the county's coat of arms and flag. Elevations are high for the region in the north and west. These reach over 240m in the western projection around Tring which is in the Chilterns. The county's borders are approximately the watersheds of the Colne and Lea; both flowing to the south; each accompanied by a canal. Hertfordshire's undeveloped land is mainly agricultural and much is protected by green belt. The county's landmarks span many centuries, ranging from the Six Hills in the new town of Stevenage built by local inhabitants during the Roman period, to Leavesden Film Studios. 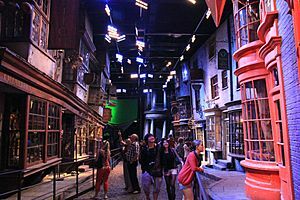 Leavesden filmed much of the UK-based $7.7 Bn box office Harry Potter film series and has the country's studio tour. 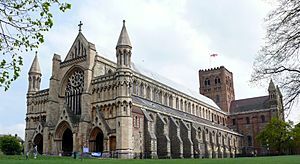 The volume of intact medieval and Tudor buildings surpasses London, in places in well-preserved conservation areas, especially in St Albans which includes some remains of Verulamium, the town where in the 3rd century an early recorded British martyrdom took place. Saint Alban, a Romano-British soldier, took the place of a Christian priest and was beheaded on Holywell Hill. His martyr's cross of a yellow saltire on a blue background is reflected in the flag and coat of arms of Hertfordshire. 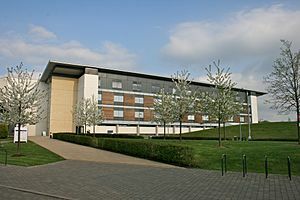 Hertfordshire is well-served with motorways and railways, providing good access to London. The largest sector of the economy of the county is in services. 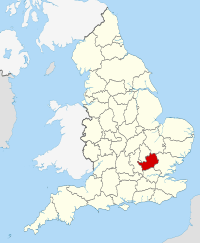 Hertfordshire was the area assigned to a fortress constructed at Hertford under the rule of Edward the Elder in 913. Hertford is derived from the Anglo-Saxon heort ford, meaning deer crossing (of a watercourse). The name Hertfordshire is first recorded in the Anglo-Saxon Chronicle in 1011. Deer feature in many county emblems. There is evidence of humans living in Hertfordshire from the Mesolithic period. It was first farmed during the Neolithic period and permanent habitation appeared at the beginning of the Bronze Age. This was followed by tribes settling in the area during the Iron Age. Following the Roman conquest of Britain in AD 43, the aboriginal Catuvellauni quickly submitted and adapted to the Roman life; resulting in the development of several new towns, including Verulamium (St Albans) where in c. 293 the first recorded British martyrdom is traditionally believed to have taken place. Saint Alban, a Romano-British soldier, took the place of a Christian priest and was beheaded on Holywell Hill. His martyr's cross of a yellow saltire on a blue background is reflected in the flag and coat of arms of Hertfordshire as the yellow background to the stag or Hart representing the county. He is the Patron Saint of Hertfordshire. With the departure of the Roman Legions in the early 5th century, the now unprotected territory was invaded and colonised by the Anglo-Saxons. By the 6th century the majority of the modern county was part of the East Saxon kingdom. This relatively short lived kingdom collapsed in the 9th century, ceding the territory of Hertfordshire to the control of the West Anglians of Mercia. The region finally became an English shire in the 10th century, on the merger of the West Saxon and Mercian kingdoms. A century later the victorious William of Normandy received the surrender of the surviving senior English Lords and Clergy, at Berkhamsted, resulting in a new Anglicised title of William the Conqueror. He then embarked on an uncontested entry into London and coronation at Westminster. After the Norman conquest, Hertfordshire was used for some of the new Norman castles at Bishop's Stortford and at the royal residence of Berkhamsted and at King's Langley, a staging post between London and the royal residence of Berkhamsted. The Domesday Book recorded the county as having nine hundreds. Tring and Danais became one—Dacorum—from Danis Corum or Danish rule harking back to a Viking not Saxon past. 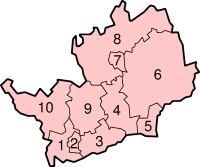 The other seven were Braughing, Broadwater, Cashio, Edwinstree, Hertford, Hitchin and Odsey. The first shooting-down of a zeppelin over Great Britain during WW1 happened in Cuffley. As London grew, Hertfordshire became conveniently close to the English capital; much of the area was owned by the nobility and aristocracy, this patronage helped to boost the local economy. However, the greatest boost to Hertfordshire came during the Industrial Revolution, after which the population rose dramatically. In 1903, Letchworth became the world's first garden city and Stevenage became the first town to redevelop under the New Towns Act 1946. From the 1920s until the late 1980s, the town of Borehamwood was home to one of the major British film studio complexes, including the MGM-British Studios. Many well-known films were made here including the first three Star Wars movies (IV, V, & VI). The studios generally used the name of Elstree (the adjoining village). American director Stanley Kubrick not only used to shoot in those studios but also lived in the area until his death. In more recent times, Elstree has had the likes of Big Brother UK and Who Wants To Be A Millionaire? filmed there, whilst EastEnders is also filmed at the studios. Also Hertfordshire has seen development in other film studio complexes, Leavesden Film Studios were developed on the Leavesden Aerodome site, north of Watford. The Harry Potter series was filmed at the studios, whilst the 1995 James Bond film GoldenEye was also filmed there. On 17 October 2000, the Hatfield rail crash killed four people with over 70 injured. The crash exposed the shortcomings of Railtrack, which consequently saw speed restrictions and major track replacement. On 10 May 2002, the second of the Potters Bar rail accidents occurred killing seven people; the train was at high speed when it derailed and flipped into the air when one of the carriages slid along the platform where it came to rest. In early December 2005, the 2005 Hemel Hempstead fuel depot explosions occurred at the Hertfordshire Oil Storage Terminal. In 2012, the canoe and kayak slalom events of the 2012 Summer Olympic Games took place in the town of Waltham Cross, within the borough of Broxbourne. Following a proposal put forward by The Welwyn Garden Heritage Trust, town-planner Andrés Duany has suggested that designated "Garden Villages" could be built within Hertfordshire to relieve some of the pressure for new homes, with perhaps a third Garden City to follow. 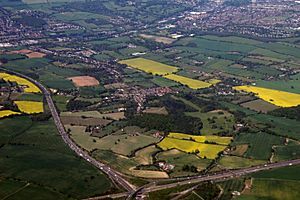 Hertfordshire is the county immediately north of London and is part of the East of England region, a mainly statistical unit. A significant minority of the population across all districts are City of London commuters. To the east is Essex, to the west is Buckinghamshire and to the north are Bedfordshire and Cambridgeshire. The county's boundaries were roughly fixed by the Counties (Detached Parts) Act 1844 which eliminated exclaves; amended when, in 1965 under the London Government Act 1963, East Barnet Urban District and Barnet Urban District were abolished, their area was transferred to form part of the present-day London Borough of Barnet and the Potters Bar Urban District of Middlesex was transferred to Hertfordshire. The highest point in the county is at 245 metres (804 ft) (AOD) on the Ridgeway long distance national path, on the border of Hastoe near Tring with Drayton Beauchamp, Buckinghamshire. An unofficial status, the purple star-shaped flower with yellow stamens, the Pasqueflower is among endemic county flowers. The rocks of Hertfordshire belong to the great shallow syncline known as the London Basin. The beds dip in a south-easterly direction towards the syncline's lowest point roughly under the River Thames. The most important formations are the Cretaceous Chalk, exposed as the high ground in the north and west of the county, forming the Chiltern Hills and the younger Palaeocene, Reading Beds and Eocene, London Clay which occupy the remaining southern part. The eastern half of the county was covered by glaciers during the Ice Age and has a superficial layer of glacial boulder clays. Despite the spread of built areas, much of the county is given over to agriculture. One product, now largely defunct, was water-cress, based in Hemel Hempstead and Berkhamsted supported by reliable, clean chalk rivers. Some quarrying of sand and gravel occurs in the St Albans area. In the past, clay has supplied local brick-making and still does in Bovingdon, just south-west of Hemel Hempstead. The chalk that is the bedrock of much of the county provides an aquifer that feeds streams and is also exploited to provide water supplies for much of the county and beyond. Chalk has also been used as a building material and, once fired, the resultant lime was spread on agricultural land to improve fertility. The mining of chalk since the early 18th century has left unrecorded underground galleries that occasionally collapse unexpectedly and endanger buildings. Fresh water is supplied to London from Ware, using the New River built by Hugh Myddleton and opened in 1613. Local rivers, although small, supported developing industries such as paper production at Nash Mills. 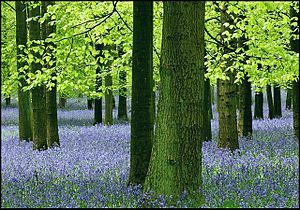 Hertfordshire affords habitat for a variety of flora and fauna. One bird common in the shire is the Royston crow, which is the eponymous name of the regional newspaper, the Royston Crow published in Royston. In November 2013, the uSwitch Quality of Life Index listed Hertfordshire as the third-best place to live in the UK. Walter Rothschild Zoological Museum, Tring a museum-annotated collection of dead mammals, birds, reptiles and insects. Hertfordshire lies across major road and rail routes connecting London to the Midlands, Northern England and Scotland. 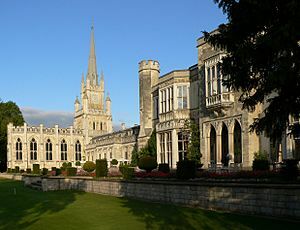 As one of the home counties, many towns in the county form part of the London commuter belt. The county has some of the principal roads in England: A1, A1(M), A5, A6, A41, M1, M11, and M25. five stations on the London Underground Metropolitan line— Chorleywood, Croxley, Moor Park, Rickmansworth and Watford — are in Hertfordshire. Stansted and Luton are within 10 miles (16 km) of the county's borders. A commercial airfield is at Elstree for light aircraft. 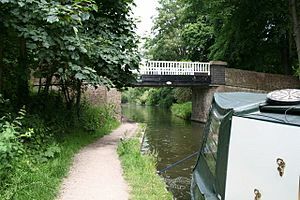 The Grand Union Canal passes through much of the far west of Hertfordshire: Rickmansworth, Watford, Hemel Hempstead, Berkhamsted and Tring. Local bus services are run by a number of private operators. Intalink is an organisation run by the county council that manages transport and funds bus services in rural areas. Hertfordshire is the location of Jack Worthing's country house in Oscar Wilde's play The Importance of Being Earnest. Jane Austen's novel Pride and Prejudice is primarily set in Hertfordshire. Topographical scholars place the town of Meryton either as Hertford or Hemel Hempstead, based on how far Mr Collins travels on the post from Watford, in either an easterly or westerly direction. The former location places the Bennet family home Longbourn as the town of Ware. The location of Mr Jarndyce's Bleak House in Charles Dickens's Bleak House is near St. Albans in Hertfordshire. The eponymous residence in E. M. Forster's novel, Howards End was based on Rooks Nest House just outside Stevenage. In the novel, Forster describes Hertfordshire as "England at its quietest". George Orwell based his book Animal Farm on the village of Wallington, Hertfordshire where he lived between 1936 and 1940. Manor Farm and The Great Barn both feature in the novel. Hertfordshire Facts for Kids. Kiddle Encyclopedia.